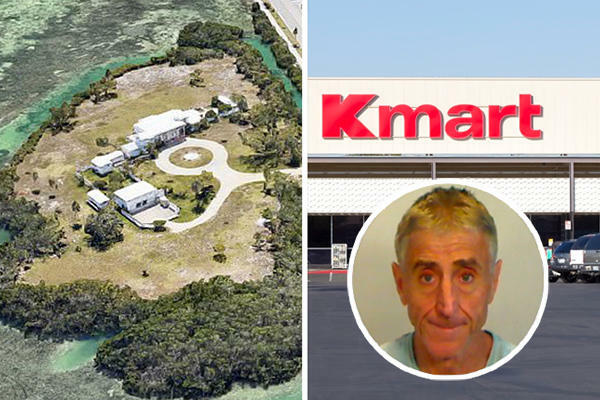 A Florida man, who paid $8 million for a private island off Key West last month, just got caught stealing about $300 of merchandise from a Kmart store. Andrew Lippi, 59, bought products from the Kmart in Key West and collected refunds by returning the containers without the original products inside, the New York Daily News reported. According to a police report, Lippi paid about $160 for a Keurig coffee maker at the Kmart on March 30 and got a full refund the next day by returning the Keurig container with a basketball inside. A few days later, at the same store, he paid slightly more than $100 for a coffee maker and eight light bulbs before getting a refund the same day by returning the containers with an older coffee maker and a different brand of light bulbs. Lippi also bought a bed skirt and got a refund by returning a pillow case instead. Video from a store-security camera shows him buying and returning all the merchandise.